DERRICK SUTTON and his wife sell their artwork and jewelry in their Etsy store. After using simple internet marketing techniques to promote their work, they saw their Etsy sales increase dramatically. 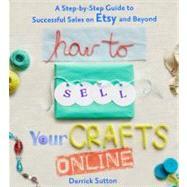 Based on these techniques, Derrick produced this guide to help other artists and crafters increase their success. IF YOU haven't yet set up a shop on Etsy, you will need to visit the link below and fill in the details. One of these steps will be choosing a shop name, so I recommend you read this chapter before completing this step. If you already own an Etsy shop and are experiencing low sales, then you may wish to open a new shop using the techniques in this chapter. When it comes to choosing a name for your Etsy shop and for your Web site (which will be covered in more detail in a future chapter), it's really important that you take some time to find the best option: one that will both represent the items you're selling as well as help you rank in the search engines. Take time to make a list of your most common items; is there a theme or "keyword" that can act as a neat summary for your creations? Sometimes you may find Etsy shops whose shop names have very little in common with the products they are selling, and in terms of a shop being optimized for the Internet this can be counterproductive. When it comes to choosing a name for your Etsy shop, you can use a keyword, which may help you to rank in the search engines. Or perhaps you prefer something more fun or personal, e.g., using your own name for your shop. Let's look at both options. A keyword, in terms of the Internet, is a word that the search engines use to categorize and decide what a Web site, or piece of content or article, is about. If, for instance, you're selling photographic art prints, then your keywords would be "Photographic Art"; if you were selling handmade Celtic jewelry, then your keywords would be "Celtic Jewelry." This may sound obvious, but working out the essence of what you're selling and choosing keywords will help you with the topics throughout this book, as well as give you a boost when it comes to placement with the search engines. You could use your keywords within the title of your shop; for example, if you were selling fine art, you could call your shop something along the lines of "Fine Art by--------", or if you were selling handmade tote bags, you could call the shop "Tote bags by ." This may sound unimaginative, but it can tell visitors to your shop, in a glance, exactly what you're selling as well as helping the search engines decide where your shop fits within their rankings. The sample Etsy shop I'm going to use throughout this book is selling sea glass jewelry. So if I chose the shop name "Sea Glass Jewelry Box," I would be using my keywords "Sea Glass Jewelry." The search engines would "read" the shop title and this would give my shop a slight boost if I wanted to rank for the phrase "Sea Glass Jewelry." However, you may wish to have a more thoughtful or imaginative name for your shop or perhaps, as mentioned, you want to build your brand using your name. This is fine, because the techniques and exercises in this book are going to help you optimize your shop for the items you're selling. Think of using your keyword in your shop title as a small boost in search engine optimization, rather than an essential decision. The one thing to bear in mind is that youshould choose a brief, memorable name, which is both positive and appealing to your customers. You will also need to ensure that your shop name is between four and twenty characters long to fit within Etsy's requirements and bear in mind that, once you choose your shop name, it can't be changed at a later date. A fun way to tackle this exercise is to brainstorm and write down a few names and options, perhaps using keywords as well as more personal choices, and then ask friends or family to help you decide. But what if you're selling more than one item? You may be creating and selling both jewelry and artwork, so how do you choose a name for your Etsy shop? If you're an existing seller, then you could run a simple analysis of your shop and decide which item sells the most and is of the most interest to browsers and customers, as well as having the highest value. If you're new to selling, then you could still use the above solution, analyzing your items to see which of them you will be concentrating your efforts on and are going to be the most profitable. If you're planning on selling more than one type of product and they have nothing in common, for example, sea glass jewelry and landscape photography, then there is no reason why you can't open two Etsy shops. The only thing you need to bear in mind is that you must link your shops by disclosing them in each shop's announcement. If you're selling different items, then you can work towards your shop having a "theme," which will unite your creations. This can be achieved in a number of ways (all of which are covered in future chapters). A few ways to ensure your shop stands out from other sellers and has a strong sense of unity is your choice of shop name, distinct and sharp photography as well as the color schemes you use for backgrounds in your photographs, how you title your items, and your Etsy banner. If you tie all of these together, then your shop will have a distinctive and identifiable look and feel, even if you are selling different items. If you take a little time to look at a cross section of Etsy shops, you will see how organized and well-presented some of them are, as opposed to the less well-planned shops, which can sometimes look fairly chaotic and haphazard and do not have a clear theme. Whether you're going to start a new Etsy shop with a keyword-specific name or stick with an existing shop, you'll need to ensure your store is fully optimized for the search engines. This topic is covered in chapter 2. Find keywords that summarize your items for your Etsy shop name, or choose a warm, memorable, and professional name. Analyze a cross section of Etsy shops to see how other sellers represent themselves through their shop names. Get a second opinion--conduct a poll with friends, family, or colleagues and ask them to choose the best name for your shop from a list of brainstormed suggestions. Copyright 2011 by Derrick Sutton. All rights reserved. Printed in China. For information, address St. Martin's Press, 175 Fifth Avenue, New York, N.Y. 10010. IF YOUhaven't yet set up a shop on Etsy, you will need to visit the link below and fill in the details. One of these steps will be choosing a shop name, so I recommend you read this chapter before completing this step.